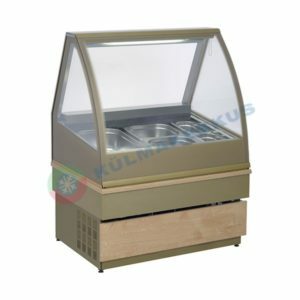 This model is intended for the presentation and sale of fresh vegetable, fruits or fresh salads. There is a possibility to put different gastro trays into the unit with maximum depth of 150 mm. Front and side glass are double, tempered and insulating. The operation of the showcase is controlled electronically, including the automatic defrosting. There is a fluorescent light in the top to increase the attractiveness of the displayed goods, blind in the back part to close the cooling area. The unit has adjustable feet and it is delivered without gastro trays by default.